Apologies to both the interviewee and to Anne Rice for that title… I simply couldn’t resist. Besides, Mike opens this guest post by talking about his sense of humor, so it’s really his own fault that I went there. 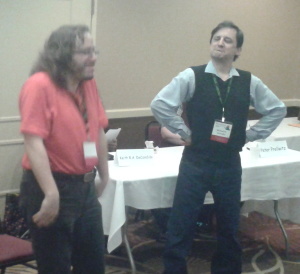 Those are photos from an Eye of Argon reading I was privileged to witness one night at (I think) Mysticon. In the first photo, KT Pinto and Pete Prellwitz are in the background; in the second, Mike’s goofing around with Keith DeCandido. They were all spectacularly funny. You gotta like anyone who’s willing to ditch dignity and have so much fun! 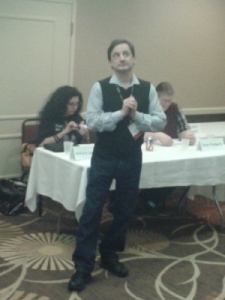 Besides, Mike is smart, well-spoken, a great presenter, panelist, and debate companion. So there you go. That’s why I’m giving him space here today. How important is humor in creating a believable setting? Humor is important in life. Everyone loves to laugh, and not a day goes by without someone cracking a joke, even in the worst of situations. That’s why I really dislike depressing, serious drama or books where not one of the characters seems to have a sense of humor. My books have a sense of humor. They’re not comedies, but my characters will crack jokes, be sarcastic, insult each other, and otherwise act like real people. Sometimes humor is used as a defense in a tense situation; sometimes it defines a character’s personality. In Bloodsuckers: A Vampire Runs for President , you’ll find Hannah Cohen, who has had a tough life and fights back with sarcasm at everyone. Sometimes she can be very funny, but sometimes she is just cruel. And there’s a reason for that – she’s not there as comic relief. She has that personality to help round out her character and make her believable, and someone we can actually care for, despite her faults. Do you find fantasy settings created in a real-world framework inherently more believable than one set in a completely fictitious surrounding? No, and vice versa. Seriously, either one can be done well or poorly. There are some great fantasy novels that take place completely in magical worlds that have no relationship to the real world. Tolkien, despite his story-telling faults, created an intricate world which is internally consistent and realistic on its own terms. Talented fantasy writers like David Eddings, Tad Williams, George R.R. Martin – three examples off the top of my head – understand that the world has to make sense politically, economically, and geographically as well as magically for it to work. Simply plopping a bunch of wizards into the middle of your standard based-on-medieval-Europe world is not enough. My fantasy novels take place in the world of Fortannis, which in some ways is a standard traditional based-on-medieval-Europe series — and there is nothing wrong with that. But that can’t be the end of it. The first novel in the series, Arch Enemies , stretches over 800 years. Things change other than just who the current king is. The language isn’t the same; fashion is different; new magic is discovered; new lands and new people demand new rights and privileges. Too often I read fantasy where some long-lived elf talks about how things were 1000 years ago and it’s exactly the same. Hell, modern America isn’t at all what it was like fifty years ago – why should your fantasy world be stuck in time? Bloodsuckers is basically a fantasy novel (it not only has vampires but also honest politicians), and it takes place in the real world. In order to make that believable, I had to explain how vampires had existed for so long and never discovered. I used real history and real politics to make it as believable and real as possible, and put in lots of references to modern culture so that readers could relate. I researched travel time and locations so as not to jar readers who knew these things, and interviewed experts about FBI procedures, guns, modern fighting, hotel management and other aspects of real life that I wanted to make as believable as possible. It’s much easier to accept the fantastic parts of the story if the real world in which it is embedded is relatable. The Harry Potter novels, as much as I love them for other reasons, fails on this point. There’s no way this many wizards doing this many things could exist in our real world without being noticed for this long, especially when they marry muggles all the time. And why would these real world wizards not use modern things as well? Why didn’t Hermione demand a computer for school? Why didn’t Voldemort just shoot everyone with AK 47s? “It’s a kid’s novel” is not a good excuse in the slightest. Thanks for chiming in, Mike, that was fun! Please feel free to rummage through my blog bag-o-topics and send me another post anytime! 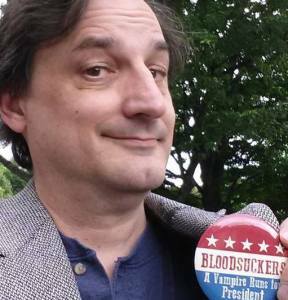 Michael A. Ventrella’s third novel Bloodsuckers: A Vampire Runs for President was released in 2014 to excellent reviews. On his web page, he interviews authors, agents, and editors with advice to help starting writers. He also edits the Tales of Fortannis anthologies, the third of which (A Bard Day’s Knight) will be released in March of 2015. He’s currently working on an anthology of Alternate Sherlock stories, co-edited with New York Times Bestselling Author Jonathan Maberry.